THURSDAY, May 10, 2018 (HealthDay News) -- In a new study, a widely used form of spinal surgery was no more effective than placebo in treating spinal fracture pain for people with osteoporosis. Researchers and experts now say that the technique -- called vertebroplasty -- should not be a standard pain treatment for these patients. "The role of this procedure in the routine treatment of osteoporotic compression fractures is not supported," said Dr. Nathaniel Tindel, one expert who wasn't connected to the new study. "Patients considering this procedure should be informed of the lack of effectiveness and the potential complications," said Tindel, an orthopedic spine surgeon at Lenox Hill Hospital in New York City. The new research was led by Paul Lohle of Elisabeth-TweeSteden Hospital in Tilburg, the Netherlands. 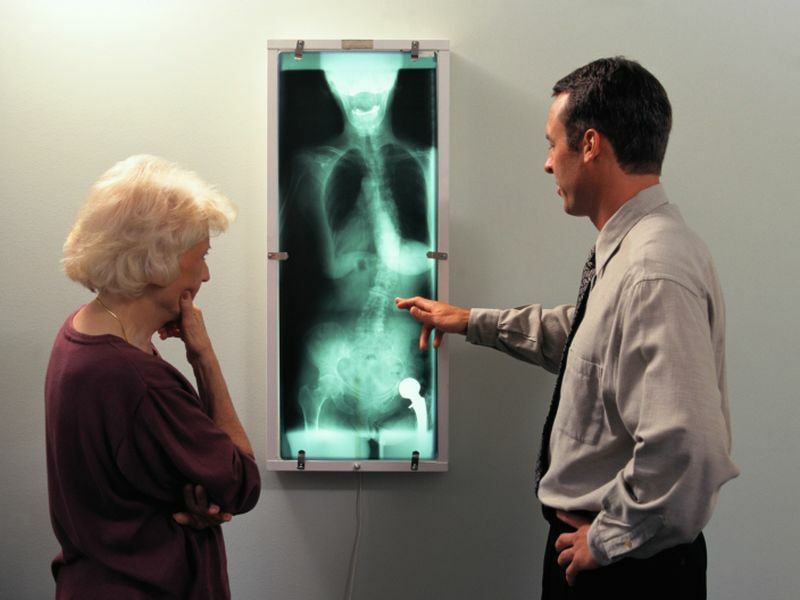 His team explained that osteoporosis-related fractures most often occur in the spine and are called vertebral compression fractures. These injuries can cause deformity, breathing problems and even a loss of height. Vertebroplasty involves the injection of a special cement into the fractured bone in an attempt to stabilize it and relieve pain. The new Dutch study included 180 adults over age 50 who had one to three vertebral compression fractures that were up to nine weeks old. The patients were randomly assigned to receive either vertebroplasty (91 patients) or a placebo procedure with local anesthetic injections (89 patients). The participants' pain levels were tracked at one day, one week, and one, three, six, and 12 months after the procedure. At all follow-up points, both groups had statistically significant reductions in pain score, Lohle's team said, with little difference between the two groups. Overall, vertebroplasty appeared to have no effect on people's level of disability or quality of life, according to the study published May 9 in the BMJ. So, the results "do not support vertebroplasty as standard pain treatment in patients with osteoporotic vertebral compression fractures," the study authors said in a journal news release. Dr. Qusai Hammouri is an orthopedic surgeon at Staten Island University Hospital in New York City. He said the Dutch researchers conducted a "great study." "This study is of good quality and methodology," Hammouri said, and "it will help inform clinicians in regards to vertebroplasty for pain control." But he said there were a few unanswered questions from the research. "What this study doesn't look at or comment on is whether there are benefits in the long term for vertebroplasty as far as total posture of the patient [a decrease in the hunching forward you see in older patients]," Hammouri said. "We need more studies like this to determine this." For his part, Tindel warned that vertebroplasty "is still being widely used, despite prior research also "debunking the theoretical benefits of [vertebroplasty]." Beyond that, "reported complications from the procedure can be quite serious and even life-threatening," Tindel said.